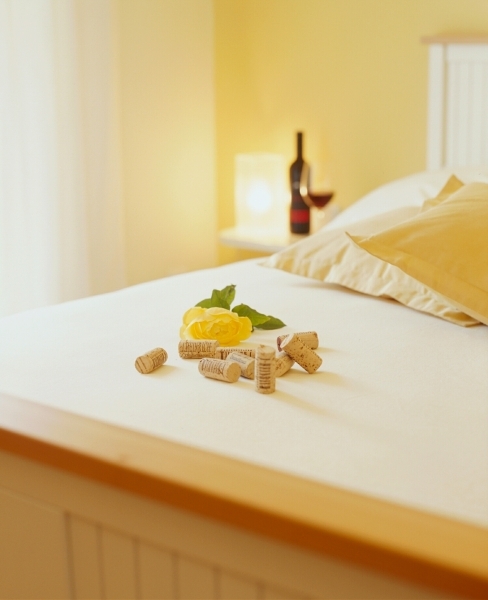 Combine your passion for wine with a relaxing stay in the heart of Blaufränkischland. Enjoy a wine tasting in the ambience of the flowered courtyard, stay in our theme rooms Goldberg, terra o., Vitikult and Siglos. Each room is individually designed and equipped with shower, toilet, hairdryer, TV and balcony. The prices are in Euro per person and per night. From four nights we create an individual offer. Our rooms are rented from mid-April to the end of August. The rooms are available from 2 pm on the day of arrival and until 10 am on the day of departure. Arrival is possible until 18 o’clock – if you want to arrive later, please let us know. We will gladly deposit your key. The parking spaces in front of the house are reserved for you. The breakfast buffet is served from 8 to 10 o’clock. In fair weather, we cover the breakfast in the leafy courtyard. During the day or in the evening, you can use the espresso machine or the wine cooler as you wish. Get to know the variety of our local variety Blaufränkisch during a tasting. We ask for an appointment. Outside the tasting times you can enjoy our wines at the Abhof prices on the terrace or in our wine lounge. On Sundays and public holidays, the winery is closed for tastings. We ask for your understanding that our winery is a non-smoking area. Smoking is allowed on the balcony or in the garden. As much as we like our four-legged friends, they are unfortunately not allowed in our winery for reasons of hygiene. We’ve always been lucky with cancellations so far. Withdrawal from the booking is free of charge until 2 weeks before arrival. For a short-term cancellation we charge 50%, in case of no show 100% of the booking amount. By confirming your reservation you also accept our cancellation policy. A deposit is required. The settlement takes place on departure. Please note that we do not accept credit cards as a form of payment. We look forward to your reservation and your visit!